= Nihongo wo issho ni hajimemashou! = Let’s start Japanese with me! newbies who still need help reading and practicing hiranaga. language in a couple of years. Let’s start right now! We mix kanji with hiragana to write native Japanese words. Please take your time and learn how to read them. Once you learn, you can start practicing your reading. Note : つ has a small letter っ * It make the following consonant doubled. Ex. がっき = gakki, にっき = nikki, はっぴ = happi, etc. Note : は = ha could be read as “wa” when it is used as a particle for a subject. へ= he could be read as “e” when it is used as a particle for direction. Note : the pronunciation of を =wo is the same as お= o. We use it as a particle for object. Once you memorize them, you can practice reading them! :h: Now try to read longer sentences! = This is my book. = Korewa watashi no hon desu. = Excuse me. Where is the bank? = Sumimasen. Ginkou wa dokoni arimasu ka? = Why do you study Japanese? = Doushite nihongo wo benkyou shiteiru no desuka? = I went to the hospital yesterday. = Please give me a glass of water. = Omizu wo ippai kudasai. = Hiragana oboemashitaka? Sukoshi zutsu mainichi benkyou shite kudasaine. = Did you learn the hiragana? Please study them little by little everyday. I am curious about さ き are these different when we write them on a paper? Yes, they are different. き has two horizontal lines while さ only has one. but i lernt most of them! Great! Now you can move onto Kanji! I have learned some Japanese introduction lesson. It was interactive and user friendly. Keep up the good work. Thank you for visiting this site! I will post more basic lesson next year so please come back! Oooh… thank you, Maggie Sensei. My Facebook students will love this! Thank you for your comment!!! You must be my Twitter follower, Andini-san! Am I right? Oh, you have Facebook students? I am working on Katakana chart now. Hope that helps them,too. BTW your blog is awesome! Everybody, go check her site!! Maggie-sensei, thank you for the nice words. My blog is in Indonesian, I bet the crowd you sent there got confused. But with so many bells and whistles, it does look good at a glance, doesn’t it? To me you’re a daily reminder that I still have so much to learn. Thank you for sharing so generously. Big hug from Indonesia. I will definitely use your site when I want to learn Indonesian language. Learning languages seems like a long long endless journey, huh? I am still learning a lot,too. Oh no Yukari i just noticed that the top audio file is different than the first one you had also.おかしい! Hahaha!! 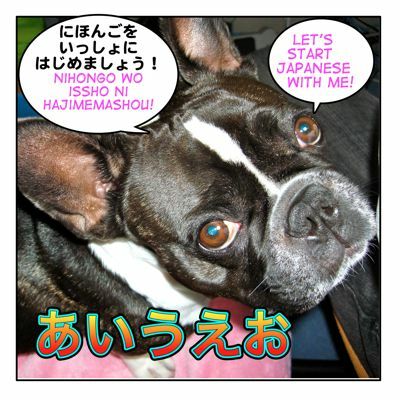 I KNEW you would ask me so I am working on Katakana now! *hugs* Thank you so much guys. Today i noticed that Victor/gimmeabreakman liked a video of a girl that was talking about her online resources BUT she didn’t mention this site!! So i made sure and left a comment about your site of course. She also mentioned a book called “Remembering the Kana” by James W. Heisig. I guess in under three hours with the book you can memorize it all? Anyway study hard guys and i hope that helps! Thank you, Itsumaru!!! You are soooo nice!! They are lots of great learning resources out there. (To be honest, I rarely check them..but..) Hope you all find the right one! がんばって！ A big hug 4U2!